IF IT’S MONDAY, and Ted’s got nothing more substantial for us (thank Christ), why, it must be Overpriced Goodwill Item of the Week…Day! You’re saying to yourself! Sure! 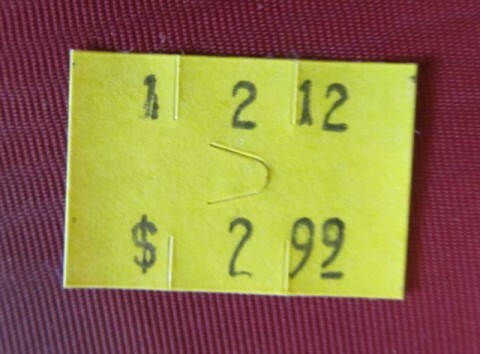 …it’s still something that you and I are betting not a whole lot of people are willing to shell out three bucks for at a thrift store. What is it? you ask. 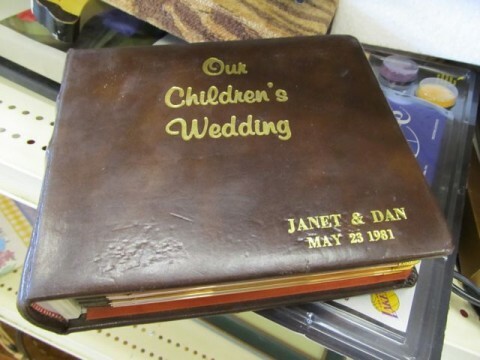 Our Children’s Wedding: Janet & Dan’s parents’ wedding album…for Janet & Dan’s wedding. If you follow all that. And what’s more…? It’s empty. No photos inside! None! Wedding pictures are notoriously uninteresting to everyone but the bride, but even so, if you’re going to put this out on the sales floor, Goodwill, why not leave the photos in it? Yes, yes, I know: Likely whoever donated it pulled the photos first and gave the thrift store an empty album. In this case – here’s a suggestion, Goodwill: It’s personalized! Without the pictures it’s even more worthless than it would be with them! And you can’t get much more worthless than worthless! And it was already worthless! So now it’s completely worthless to everyone everywhere! Unless – through a rather unlikely set of circumstances – some person just happens to have a son named Dan or a daughter named Janet and they just happened to have married someone else named Janet or Dan (whichever the case may be! ), and they did so on May 23, 1981; and somehow, over the last thirty years, this same person, the parent that is, never got around to buying an album to put their copies of the wedding photos in, and this very person just happens to be shopping in the very Goodwill that I found this…and comes across this in the bric-a-brac section! If that’s the case, and you are this person, by all means, buy the album. Buy the album, sure! And then you contact me because I’m going to have you go out and buy me a lottery ticket. Posted by Ted on January 16, 2012, 3:41 AM.